Remarkable large family Villa situated under 1km from the city centre of Gandia on the sunny Coast Blanca Coast. You enter the property via pretty double gates that lead to a large decorative driveway that would accommodate several cars. Here you will find an upper terrace that has a panoramic view of a lush green valley framed by mountains and a clear sight of Monduver, the highest peak in the area. Also on this level are two large double garages which could be used for anything from storage, studio, games room to a gym. Entrance to the villa is via a descending staircase that leads to the main floor. One of the most charming features of this property is the double bay construction with large arched windows that allow plenty of light to enter, giving this villa a bright and airy feel. Adjoined to the modern well equipped fitted kitchen is a wonderful sunlit breakfast room which is a great place to start your morning and from here you have access to another large terrace. On this level you will also find a huge living area, a cloakroom, additional bathroom, two guest bedrooms, a master bedroom with en-suite and sliding patio doors that lead to a private terrace. 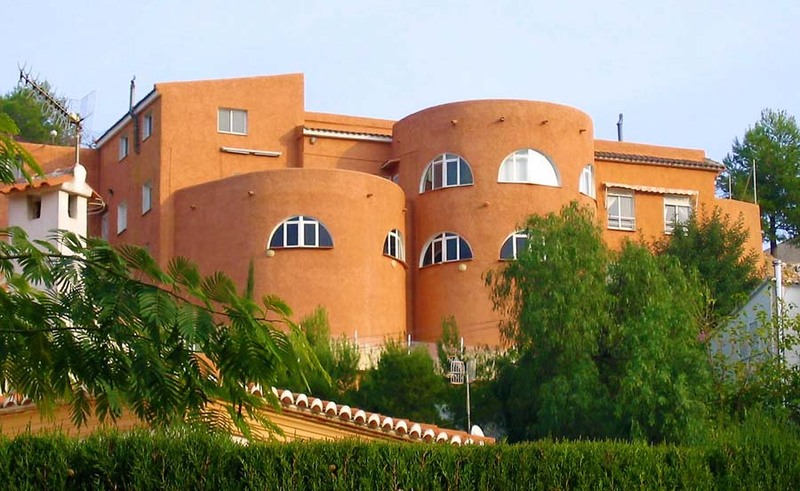 This villa is vast in size and could be used as two separate homes or as one large family home. There are steps that lead to a lower hallway and on this level you will find two bedrooms one of which has an en-suite and built-in wardrobe. Across the hallway leads to a bedroom suite that consists of a double room with large windows and its own hallway with an en-suite on one side and a dressing room/walk-in wardrobe on the other. The size of this property is truly impressive and the substantial downstairs living area is a perfect place for relaxing and enjoying the sweeping views. This area is open plan and adjoins a sizeable kitchen and games room perfect for enjoying quality time with friends and family. The lower floor/apartment has easy access to the garden and pool area. The garden has an outside barbeque and is a great place to wind down and spend the evening. There is a large terrace area that leads to a good size pool. Great for spending sun kissed days relaxing on your own or having fun with friends/family. On this level there is an outside storage room with a toilet that has the potential to be converted into an outside kitchen or shower room/changing area for the pool. To the sides of the villa there are fruit trees that provide lemons, oranges, peaches, nisperos and mulberries. All have irrigation. The property has mains water, gas oil boiler, existing telephone line, internet connection and satellite TV with a 2.4m dish. The scale of this striking villa is extraordinary and it represents a unique opportunity to own a property of this size for such a desirable price. A 2-minute drive will take you to Gandia where all the local shops, bars, restaurants, schools, medical centre, banks etc are situated. Gandia railway station is a 2minute drive away as is the main hospital. Valencia and Alicante airports are an hours drive in each direction. The beautiful blue flag beaches of Playa de Gandia are a 15 minute drive away, this is a popular summer beach resort and adjoins with The Port/Marina. This villa has superb views overlooking orange groves and valleys to the distant mountain peaks. Double doors – Steps (12) down to front door. Low level W.C, hand basin with mirror. Double doors to spacious living area, fire place, radiator, three double windows. Semi circular shaped room with three arch windows with breathtaking views. An aircon and a radiator. Double window, three double fitted wardrobes. Bath with shower, bidet, low level W.C, hand basin, radiator, skylight. Spacious room, two double fitted wardrobes, sliding window. Steps down to spacious bedroom, double windows, view to side of villa, aircon, raidator, two sets of glass door fitted wardrobes. Double doors leading to balcony. Bath, hand basin, low level W.C, bidet, double window. Steps (14) down to self contained apartment. Pretty trianglar shaped hallway with arch windows. New modernised bathroom. Corner shower, hand basin, low level W.C, frosted window. Spacious bedroom, double fitted wardrobe with en-suite shower, low level W.C and hand basin. Spacious living area, three arch windows. Fitted worktops and cupboards, space for fridge/freezer. Storage cupboard/pantry. Spacious room, two double windows with view to front of property, Snooker table, door to garden. WAS €315,000, NOW €269,995 and still offers invited!